PBTV was brought in to provide the video screens, cameras, and video processing for the project by AG Light and Sound, who handled the staging, lighting, and audio for the concert event. The 20-foot diameter LED floor supplied by PBTV for the circular performance stage was made up of digiLED DLP 5.9mm LED modules. This LED floor can support the artists’ high energy performances without damage to the LED panels and provide a relatively hi-resolution screen surface for the creative team to underlay visual imagery and content. Down on the metal awning over the entrances was a third screen,2 panels high by 89 panels wide (3’ x 146’). 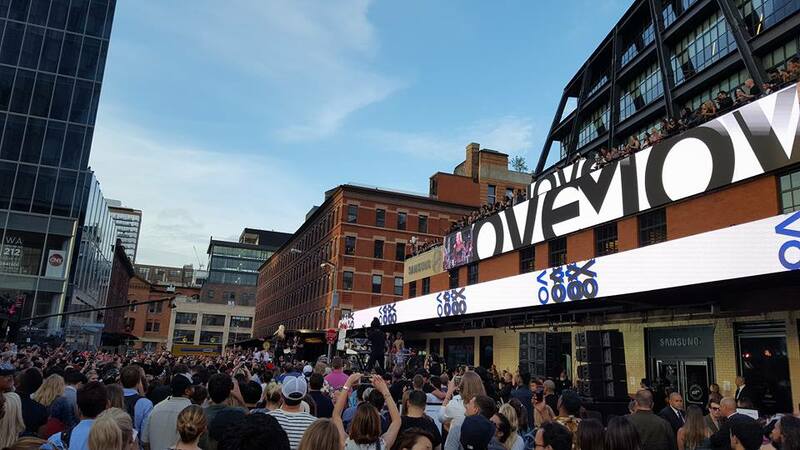 PBTV addressed everything from hanging creative LED products on the side of the building to installing all of the video signals in and around the street performance space. They created a camera position on the top of the building which gave that “must-have” overhead shot showing the great use of the LED floor under the performers. PBTV also supplied the video crew and processing, cameras, and switchers to feed the screens and complete the video system.